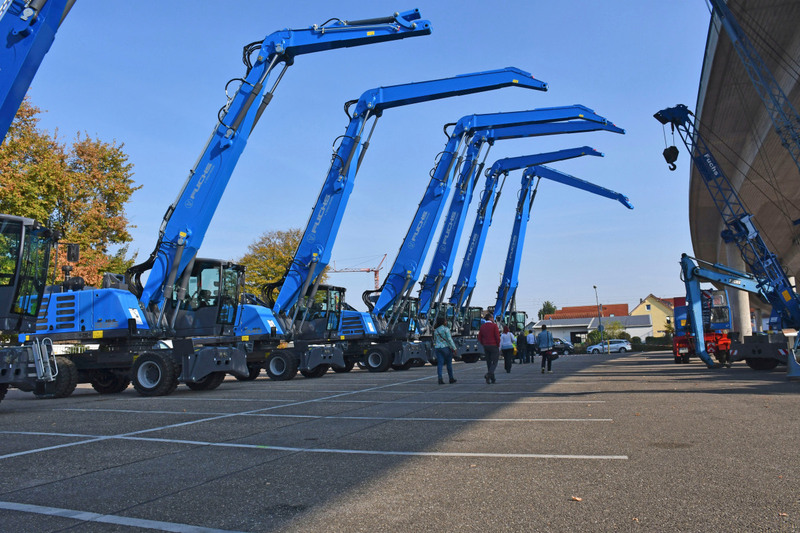 In October 2018, Terex Fuchs celebrated its 130th anniversary. 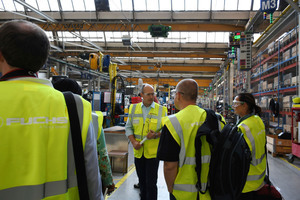 In this respect, the company took the opportunity to look back on the highlights of the company history and to give an insight into the production processes at the main site in Bad Schönborn. The company was initially founded by Johannes Fuchs in 1888 as an agricultural machinery and stable equipment manufacturing business. Since then, Fuchs has developed into a specialist material handling company. The company‘s exceptional talent for innovation was evident right from the start. In 1908, just a few years after its foundation, its Triumph feed fence was recognised as „new and remarkable“ by the German Agricultural Society. With the D1 – developed in 1975 – Johannes Fuchs could be said to have paved the way for the company‘s future in the material handling sector. 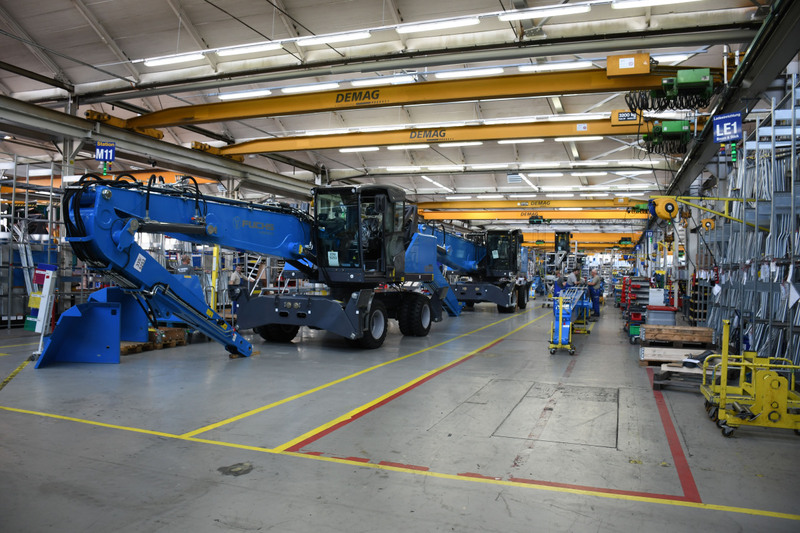 The hydraulic-lift, slewing cab was a typical example of the close working relationship the company has always had with its customers. In order to ensure that the maximum permissible distance between the steering wheel and the front of the vehicle was maintained, the steering wheel and cab were promptly swivelled 180 degrees. The resulting lifting concept was immediately patented. Today, the height-adjustable cab is regarded as a state of the art feature in material handling machines. With the „Fuchs Quick Connect System“, introduced in late 2001, the company impressively demonstrated the enormous versatility of its material handling machines. With the help of a hydraulic quick-change system, the MHL340 and MHL350 (plus other machines on request) can be adapted for a wide variety of applications within seconds. 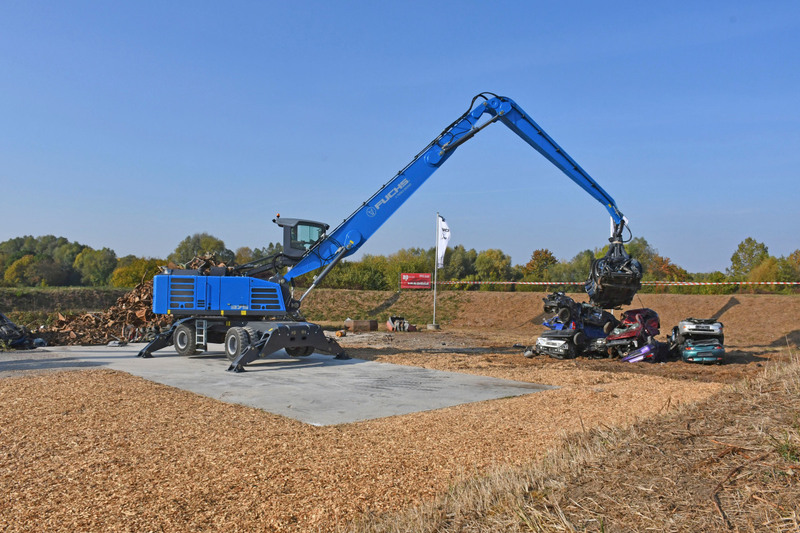 Whether a straight dipperstick with multi-tine grapple or magnet plate, a multi-purpose stick with sorting grapple or mobile scrap shears, everything can be operated with just one machine, thanks to the FQC system. A special accolade followed in 2017, when the new Fuchs cab was recognised with the renowned iF Design Award. During the development stage, all attention was brought to bear on the machine operator. The windscreen has a negative slant for a better view at close range, a feature which also creates a greater sense of spaciousness. A large panoramic glass roof in the shape of the iconic fox‘s head provides a clear view upwards. Fuchs is making the necessary investments today, to ensure its continued prosperity after the economic boom. Besides Production, the Quality, Design, Product Management, Service, Sales and Marketing divisions have also been systematically expanded: intended as an investment in a sustainable future. 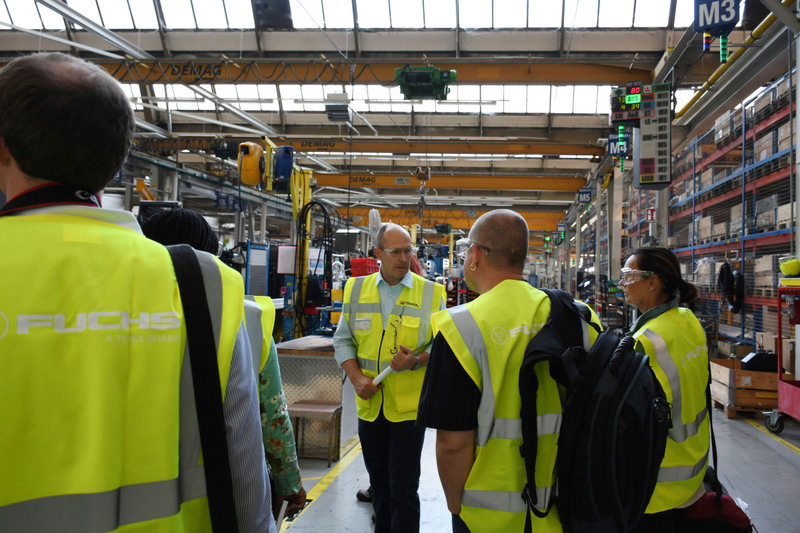 For years, Fuchs has supported its own junior staff through apprenticeships to become Industrial Mechatronics Technicians or Industrial Clerks. In the future, Fuchs will also offer exciting, practice-oriented courses in Mechanical Engineering and Business Administration at local vocational academies. Through this process, Terex aims to transform its existing M&A strategy and concentrate on lifecycle solutions, commercial excellence and strategic sourcing, with a particular focus on engineering, marketing and sales. All with a view to ensuring the highest levels of customer satisfaction. Fuchs has celebrated several world firsts in recent years. In 2014, the MHL250 E was launched – the first MHL designed specifically for the recycling industry. Compact dimensions and an extremely stable undercarriage characterise this machine. In 2016, Fuchs celebrated two world firsts. The MHL370 F is not only visually impressive due to the size of its single tyres. 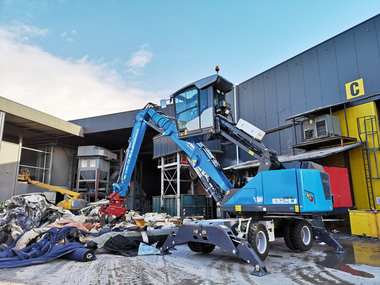 A solid undercarriage combined with the XXL tyres and increased engine power make it the perfect workhorse in scrapyards – for feeding mega shredders, for example. The MHL390 is also in a league of its own in terms of both size and performance. It is the largest machine ever developed and built by Fuchs, designed for use in scrapyards and ports anywhere in the world. Thanks to the modular system, the MHL390, like all other machines, can be perfectly tailored to customer requirements. Equipped with an optional crawler undercarriage and support, the MHL390 F has a maximum operating weight of approx. 90 tonnes. A maximum reach of 24.5 m allows loading and unloading of ships up to Handysize class. 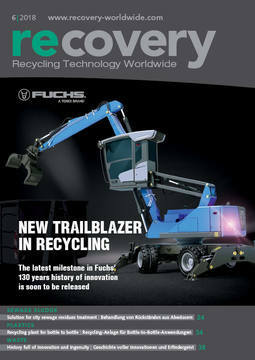 The MHL250 E is the first machine offered by Fuchs that is specially developed for the recycling industry. The company worked intensively with the customers on this next generation machine. At the most recent result of the R&D department‘s efforts the name is still missing. Since it incorporates many innovations, this machine merits its own new product name, jointly taken with the customers. The technical specifications are first-rate across the board. A maximum operating weight of 16 t, two different loading systems with a maximum reach of 9 m, a high performance cooling system and the most comfortable cab in its class speak for themselves. A closed hydraulic circuit to produce the swivelling action ensures rapid work cycles and at the same time reduces the energy required. The MHL375 closes the gap in the 60+ tonne class. Visually impressive and technically compelling, the MHL375 F is powered by a 7.8 l straight-six-cylinder engine with 245 kW or 329 PS. A newly designed hydraulic system with a closed hydraulic circuit ensures rapid swivelling and easily controllable work cycles. Two cab lifting systems are available. 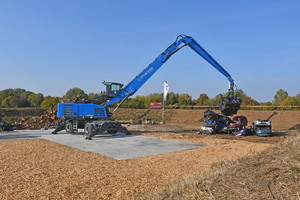 In addition to the height-adjustable cab, Terex Fuchs also offers a version that can be raised and moved forward. This brings the driver closer to the working area. A better overview ensures greater safety and can significantly increase productivity. The undercarriage has been comprehensively redesigned to accommodate the powerful axles and tyres. For demanding use in scrapyards, the standard single tyres offer outstanding driving comfort – even on uneven terrain. The absence of any tread pattern largely prevents foreign bodies from getting stuck in the tyres. However, the undercarriage design also allows the classic twin tyres to be fitted. And that‘s not all: in addition to the standard undercarriage, which already provides impressive key data, the customer can even choose to go one size larger: with a total length of 7.3 m and a width of 6.3 m, the MHL375 F offers the same footprint as the significantly larger MHL390 F. An unbeatable advantage for all customers who value maximum stability with low bearing pressure. Fuchs is becoming an international player. In keeping with the global growth strategy, the company is expanding the market coverage as well as increasing also the penetration of existing markets through targeted action. For example, the USA: Fuchs was one of the first companies to introduce the concept of a material handling machine in this important market and has become one of the most successful suppliers of material handling machines in the USA. Over the past three years, Fuchs has made targeted investments in restructuring its service and dealer networks. Both the secondment of an experienced employee from the Bad Schönborn plant and the targeted acquisition of highly experienced sales and service specialists bore their first fruit after just a few months. Nine newly acquired dealers have been supporting the sales activities in the USA since 2016. Over the past five years the company achieved a sales growth of more than 80 %. Asia has also been the focus of the market expansion strategies. Here, too, the acquisition and intensive training of new dealers and more intensive dealer management have led to impressive results. The company was able to win one of the largest projects in Asia to date. With 3 RHL880 and 4 MHL350, the customers are now benefiting from a noticeable increase in efficiency. Big data, the Internet of Things, Augmented Reality (AR) and Virtual Reality (VR) – Fuchs links these keywords under the umbrella term „innovation“, to offer customers demonstrable added value. The 130th anniversary, for example, sets the stage for one of the largest international „speed dating workshops“ in years. 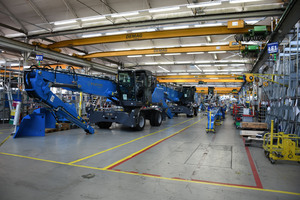 The restructuring of the special machinery business and the expansion of Product Management and Engineering divisions are laying the foundations for the solid development of new products and further development of existing ones over the next few years. The next milestones will, in fact, include the areas of big data and the IoT. With the upcoming product upgrade, the Fuchs Telematics system will allow customers to install software updates on their machines via telematics. Downtime caused by updates will then be a thing of the past. A complex algorithm will enable the telematics to predict maintenance work based on the degree to which each machine is actually used. With the help of big data, the company will revolutionise customer service. Just a few quick keywords will suffice to identify tested and promising solutions to a problem. AR will then facilitate realistic visualisations of these solutions.